What could be more comforting than a good old-fashioned Spaghetti and Meatball Dinner? 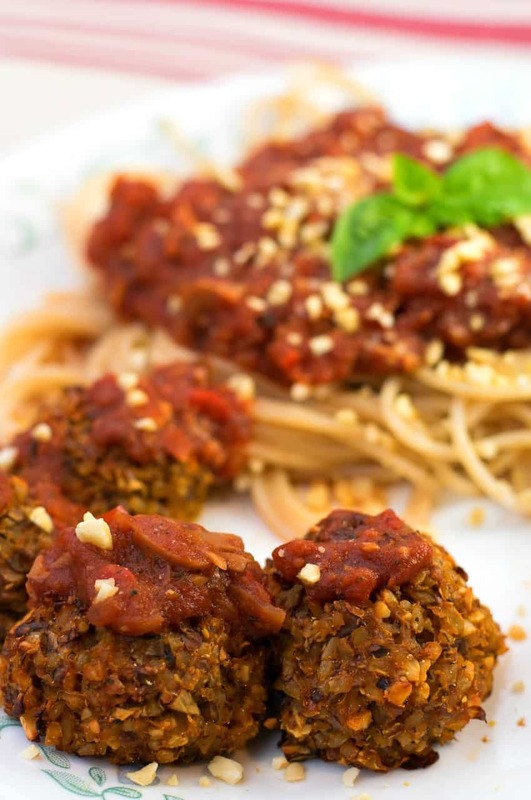 Especially when you add these Vegan Italian Meatballs made entirely from scratch! Your whole family is going to love this. I have read so many comments of people absolutely loving my Cauliflower Taco mixture, and using it in some VERY creative ways I might add. I myself have already adapted it into some pretty tasty Sloppy Joes, and into some awesome Sausage Gravy. 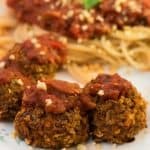 So adapting it into Vegan Italian Meatballs was really a no brainer – it was going to happen sooner or later. Well I’m glad it was sooner! Because these little guys are AMAZING. Now I will tell you, they are not as firm as a regular meatball, but the taste is spot…on… especially when you douse them with my fat-free Vegan Marinara Sauce…..oh yum. Guys…I see a meatball sandwich coming soon! We’re going to start ….. by finding some Bulgur Wheat. I went to several stores before I found it, and eventually ended up at Whole Foods in their bulk bins. If you can’t find it, I’ll include an Amazon Link (affiliate link coming soon – meaning I will make a small commission on every purchase) but it really does add to the texture of the meatballs. In addition I have heard of people using Bulgur as a meat-substitute in stews and chilis – so if you’re not allergic to wheat, it may be a new ingredient to explore. We really liked it. Once you’ve found your Bulgur, follow the package instructions to cook up 1 cup of dried Bulgur (makes about 2 cups of cooked). While that’s cooking, add 2 cups of Riced Cauliflower, 2 cups of finely minced Mushrooms, and a few cloves of minced garlic to a large pan. Stir in some Italian Seasoning, Salt, and Pepper, and let that simmer for about 5 minutes, or until softened. Stir in 1 tablespoon of Tomato Paste and mix well. Now add about 1/3 cup of Vegan Parmesan, and the 2 cups of cooked Bulgur and stir to combine. You’re also going to want a Flax Egg. This can easily be made by mixing 1 Tbs of ground Flax Seed with 2½ Tbs of very hot water. It will start to gel when stirred together and then just mix it in to the meatball mixture. Let the meatball mixture cool, enough so that you can mix things really well with your hands and form the meatballs. Preheat your oven to 400° F, and line a cookie sheet with Parchment Paper while the meat is cooling. Once the mixture has cooled, use your hands to mix it up really well and then form it into about 15 ‘ping-pong ball sized’ meatballs. If your hands get sticky – simply run them under warm water for a second. Form the meatballs and place them on the cookie sheet. Bake for 20 minutes, then carefully turn them and bake for an additional 10 minutes. Like I said, they are a little soft, but they do firm up a little when refrigerated. But the taste is amazing. And when placed on a big ole plate of spaghetti and drenched in my homemade Marinara Sauce…… mmm perfect. 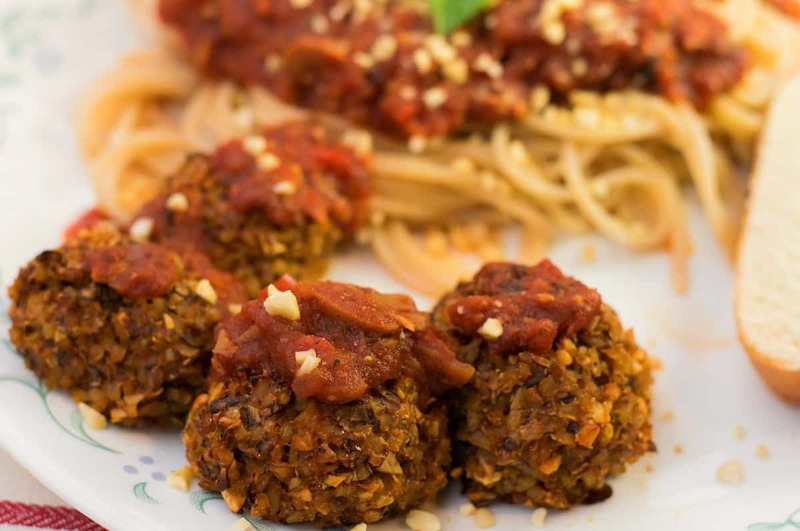 Vegan Italian Meatballs made from riced cauliflower, minced mushrooms, and Bulgur Wheat. The perfect accompaniment for your family Spaghetti Dinner. Heat Cauliflower, mushrooms, and garlic in a large pan until softened (about 5 minutes). Season with Italian seasoning, salt, and pepper. Stir in Tomato Paste and heat for an additional minute. Prepare Flax Egg by mixing 1 Tbs Ground Flax Seed and 2 1/2 Tbs boiling hot water. Once it begins to gel, add to cauliflower mixture and stir. Stir in Vegan Parmesan and cooked Bulgur. Mix well. Allow to cool enough that you can comfortably handle the 'meatballs' in your hands. Form mixture into 15 meatballs (a little less than 1/4 cup each). Place on parchment lined baking sheet and bake for 20 minutes. Carefully turn meatballs and cook for an additional 10 minutes. I love bulgur. I add it to stews and soups even before started the McDougall WOE. I can’t wait to try it. I loved your basic brown gravy recipe. I’m wondering if these meat balls would work well in stroganoff. What do you think? I made these with no alterations except just a pinch more of the Italian seasoning mix. I was surprised that they held up so well while being baked and then turned. Loved them! These meatballs look fantastic but are full of gluten. Do you have any ideas to make them gluten free? I just made them with cooked gluten free oat groats instead of the bulgur. I also just used 1/3 cup nutritional yeast instead off the “parmesan” to avoid nuts. So so good! They’re in the oven now but I tasted the mixture. I will probably eat them plain right of the baking sheet, lol. Not sure. I’m going to make these tonight though, and add a little Vital Wheat Gluten to see if they hold together better. I’ll let you know.